Historic town Honesdale is known as "Birthplace of American railroad." Once it was a mining town. Barge filled up with coal used to travel up north to New york city. Now it has become a tourist attraction. 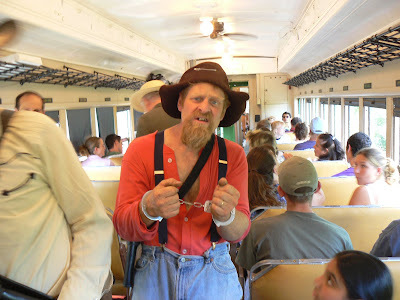 During summer , you can enjoy a train robbery. as you can see here a robber is caught ! Yes these cowboys do whole nine yards , whether it is whipping hunter or mocked hand fight। Oh yeah, did I tell you about open shooting in broad daylight too? दिनदहाड़े गोलीबारी भी हो गयी जनाब !